Explanation: After a seven month voyage through interplanetary space, NASA's Spirit Rover has reached the surface of the Red Planet and returned the first images from its landing site in Gusev crater! The entry, descent, and landing phase of its mission - referred to by mission planners as "Six Minutes of Terror" - began Saturday night around 8:30pm PST as Spirit entered the martian atmosphere at about 12,000 miles per hour. 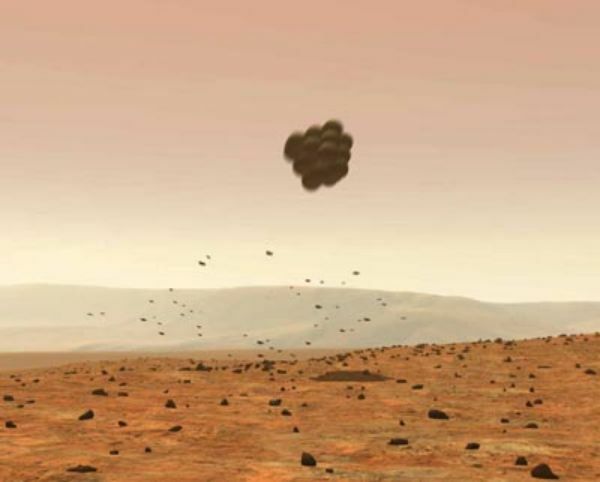 Depicted in the above artist's illustration, the spacecraft is in the final stages of its landing sequence, swaddled in large, protective airbags and bouncing to a soft landing on Mars. The same type of airbags were used for the Mars Pathfinder landing in 1997. Updates on Spirit's status will be posted throughout the day.